The structure of life can be divided into several levels, ranging from complete living organisms down to tissues, cells, cellular organelles, macromolecular assemblies and individual macromolecules, small molecules, and finally atoms. One of the easiest ways we can study biological phenomena is through the direct observation of its structure. For example, over several centuries, the light microscope answered fundamental questions in biology about organisms, tissues, cells, and cellular organelles. The transmission electron microscope extends this ability, allowing for the investigation of objects ranging in size from several microns down to individual atoms. Single-particle transmission electron microscopy represents a particularly powerful means of visualizing purified macromolecular assemblies at near-atomic level detail, allowing us to study and interconnect multiple levels of biological structural complexity. 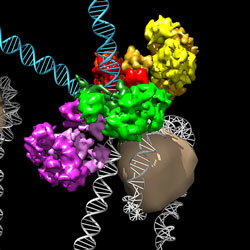 The focus of the lab is to utilize and develop transmission electron microscopy techniques to understand the biological complexity characterized by large macromolecules and macromolecular assemblies. We wish to harness the information we learn through observation of their structure under different physiological conditions in order to understand the complex roles macromolecules play in human diseases such as cancer and HIV.